It's World Series time. Boston vs Los Angeles. East coast vs west coast. The Red Sox have won the first two games and making a huge contribution was their all-star right fielder Mookie Betts. Betts is coming off his best season. He won the batting title by hitting .346. Betts also hit thirty home runs and stole thirty bases. He's the likely Most Valuable Player in the American League and his performance was a huge reason the Red Sox led the majors with 108 wins. Mookie has continued his great play in the post season. He has gone four for eight in the World Series, including three hits in game two. How does he celebrate a game two victory? Did he head for a restaurant with his teammates? Did he go to a bar? Maybe a post-game party? Mookie Betts headed to the Boston Library, where many of the areas homeless community congregate. He brought trays of food to feed them. 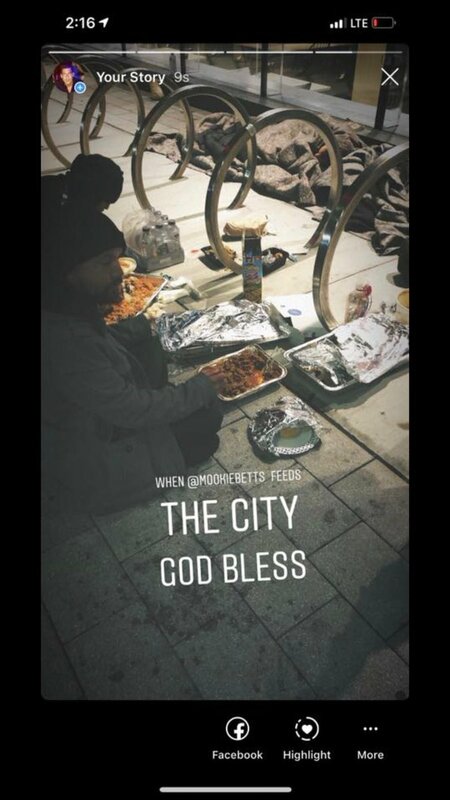 At 1am, what might be a post game snack for him and his teammates, might be that days only meal for these people who live on the street. This is far from the first time Betts has stepped up for charity. He's held a bowling tournament/fundraiser in his home state of Tennessee and in Boston. The funds help needy children and their families. He's also involved with the Red Sox charity and the Jimmy Fund which raises money for the fight against cancer. Game three of the World Series is just a few hours away. Mookie Betts will be in the lineup again as the Red Sox try to win another championship. No matter how it turns out, Mookie Betts has shown us he's a champion.